The first and only anatomical and exercise adviser for cartoonists, Kriota Willberg, has created a hilarious comic that's useful for both understanding the basics of anatomy and how muscles unfold in space. 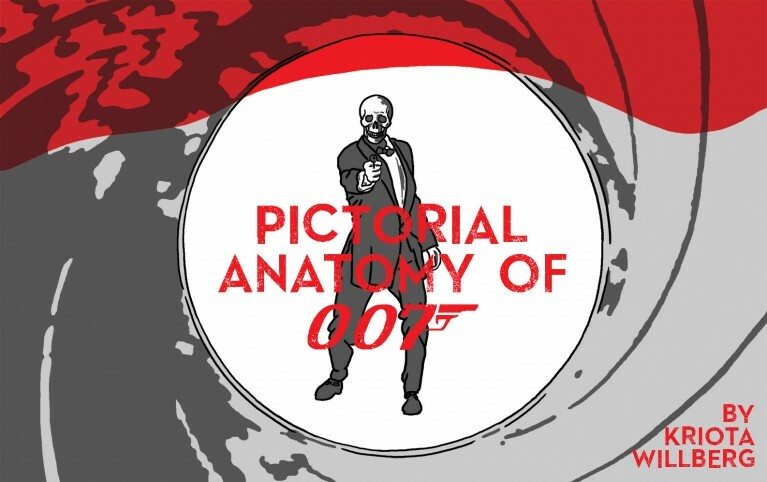 Pictorial Anatomy of 007 began as a 24-hour comic and merged her twin love of anatomical drawing and James Bond movies. The diagrams of scenes where Bond has a tarantula crawling on him, is lying in bed with a lover or is trying to electrocute Jaws with a lamp are all wittily annotated. Willberg took the original scenes and then drew a cutaway diagram depicting key parts of the muscular anatomy and explores how they all interrelate. This is an amusing goof of a mini that nonetheless has been thoroughly vetted for accuracy. In fact, it's how unsparing she is with anatomical details that makes the captions amusing, like noting that Jaws' impressively large salivary glands "surely provide him with plenty of lubrication and digestive enzymes for whatever he gnashes with his teeth". Her deep appreciation of the Bond films also allows her to gently mock them as well, creating a perfect outlet for her aesthetic interests.